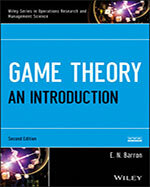 This new edition is a popular introduction to game theory and its applications. The expanded Second Edition presents a hands-on approach to game theory, and offers a blend of theory and applications, allowing readers to use theory and software such as Maple to create and analyze real-world decision-making models. The book focuses on results that can be used to determine optimal game strategies, and covers the main aspects of game theory, including the fundamentals of two-person zero-sum games, cooperative games, and population games. The book also provides a large number of examples from various fields such as economics, transportation, warfare, asset distribution, political science, and biology. The book can be used as a resource by researchers and practitioners in economics, finance, engineering, operations research, statistics, and computer science.